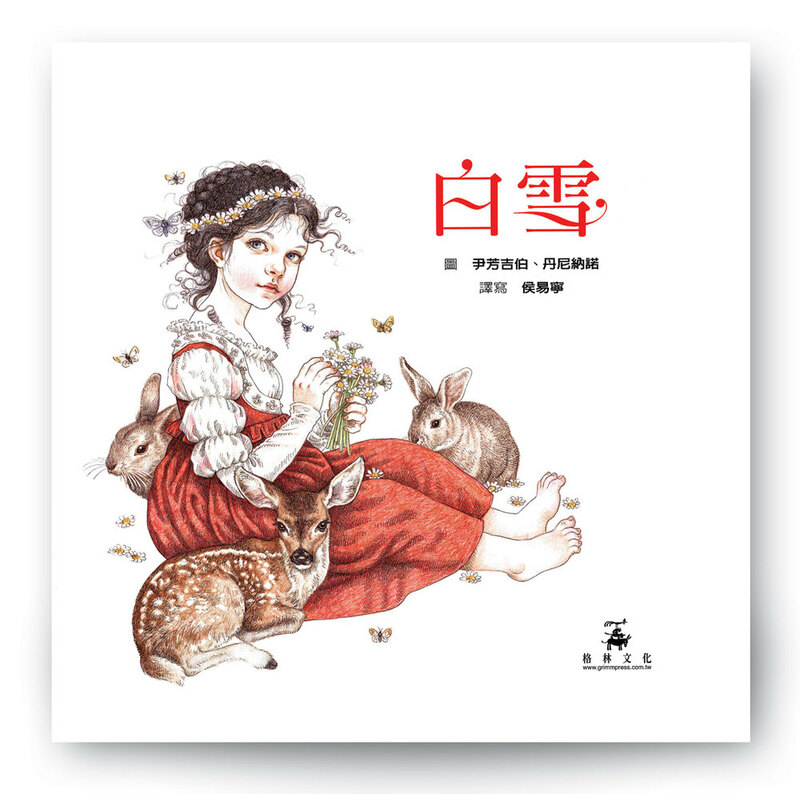 This is the first book of mine published by Grimm Press of Taiwan, a publisher of really fine children’s books with an international reputation. Danny and I met them on our first visit to the Bologna Book Fair some years ago; unlike most of the publishers there they were kind enough to both look at our work and, more importantly, agree to work with us. 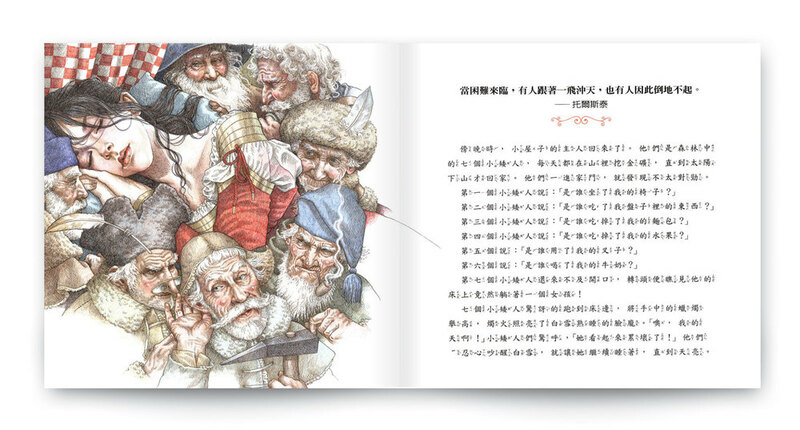 Never having worked for a far eastern company before I was unaware how familiar they are with European myths and fairy stories—when I visited them recently and talked to children both in Taiwan and mainland China I was intrigued to find that ‘The Three Little Pigs’ is THE most popular story! 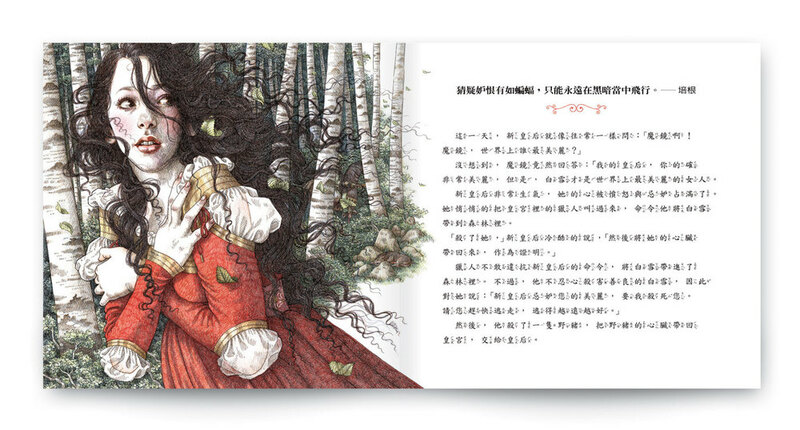 It would appear that they hold our traditional children’s literature and folk tales in much higher regard than we do. Curious! 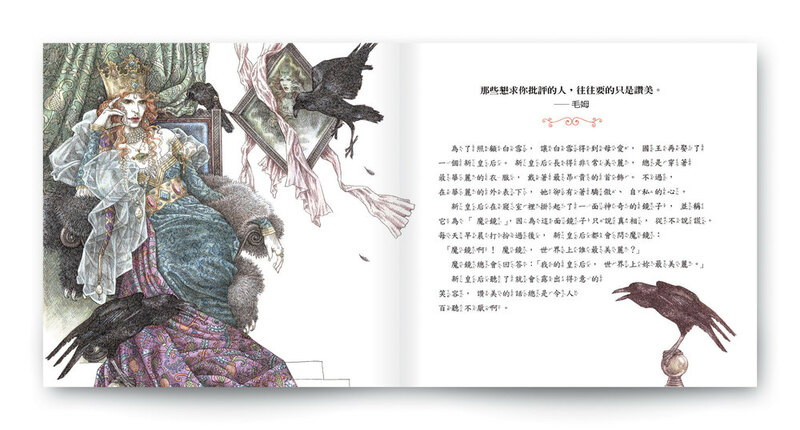 Some of the most amazing times I spent in Taiwan and China were in Grimm’s ‘Story Houses’—beautifully designed and built especially for children; combined library, book shop, storytelling facility and theatre dedicated solely to the picture-book and built to promote the love of reading and literacy in small children. A Grimm ‘Story House’ in Taichung. 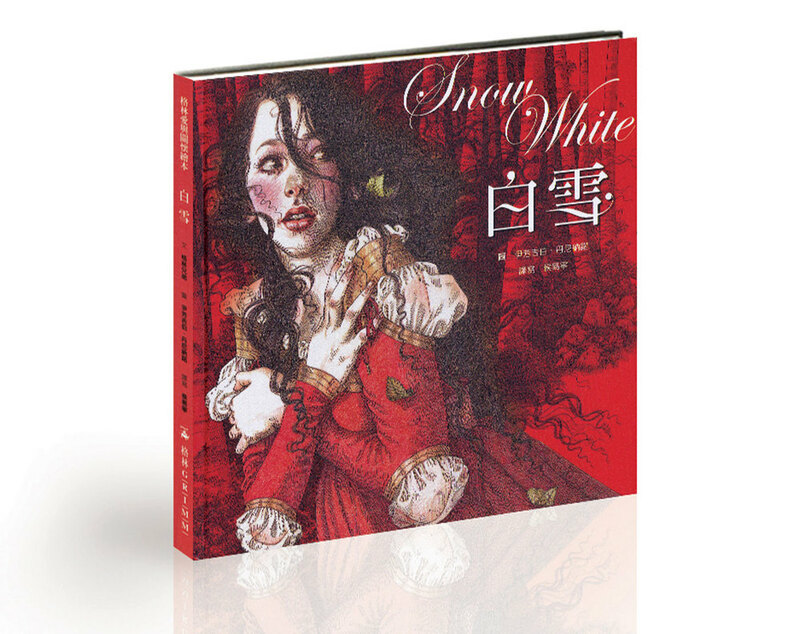 I was delighted to be offered Snow White, a story I had never tackled before, and determined to make it as fresh and new as I possibly could. There are some important differences working with publishers in a different language, the first being you are never going to read the actual manuscript, which can be a terrible handicap. 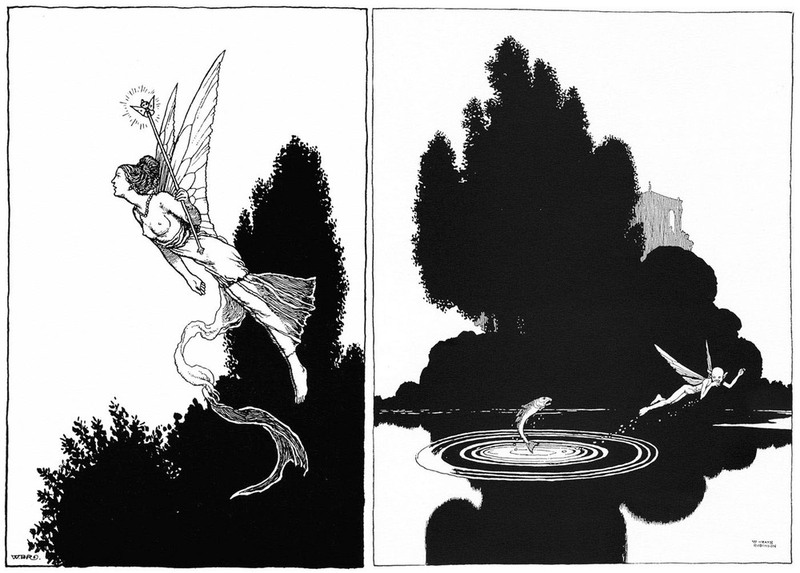 (It is my belief that the illustrator’s prime role is to interpret the words faithfully as well as creatively and without those words in full there is a danger of losing the integrity of the spreads. Readers are very quick to criticize any errors they find between the text and the illustrations!) 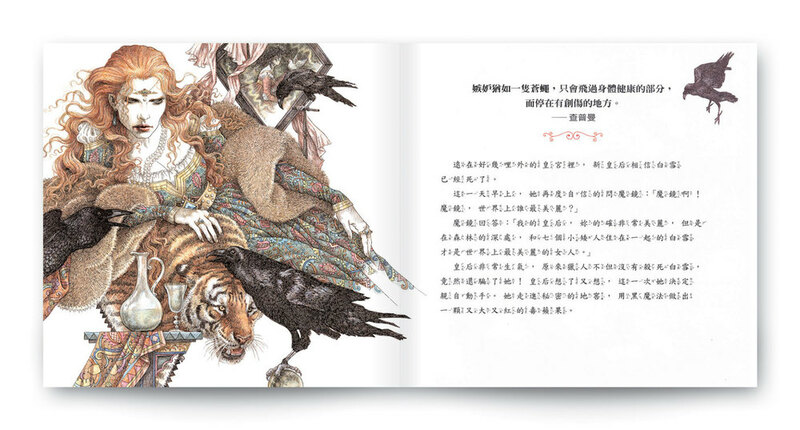 I didn’t see the actual text in Mandarin until the first printed copy; we worked by dividing the dramatic points in the story by the number of spreads available so it was just as well it was a well-known story. Because I had no idea how much room the Mandarin text would take up I decided to vignette the illustrations and at the same time keep them as light and airy as possible to avoid any imbalance between type and picture—some would be bound to have more text yet the ‘weight’ of the spreads must remain consistent. I loosened my style considerably, used a lot of line work thus allowing the illustrations to ‘breathe’ and just kept my fingers crossed that it would work. 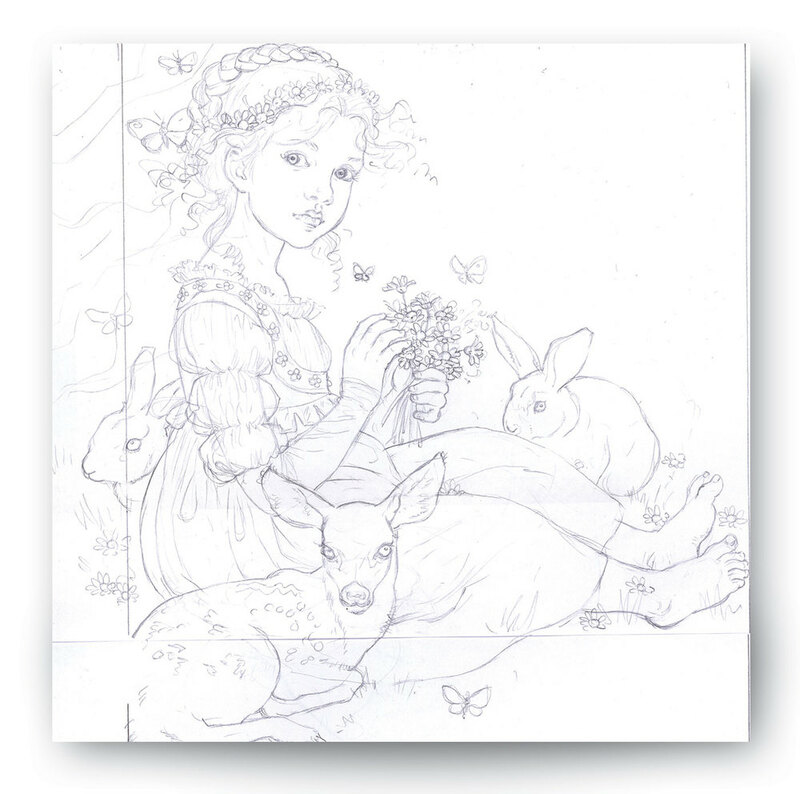 I started with a sample image of Snow white as a small girl (which eventually became the frontispiece), cheerful and confident, long before her ‘wicked stepmother’ days so that even very young readers could begin to identify with a heroine that is grown-up when the main action begins. 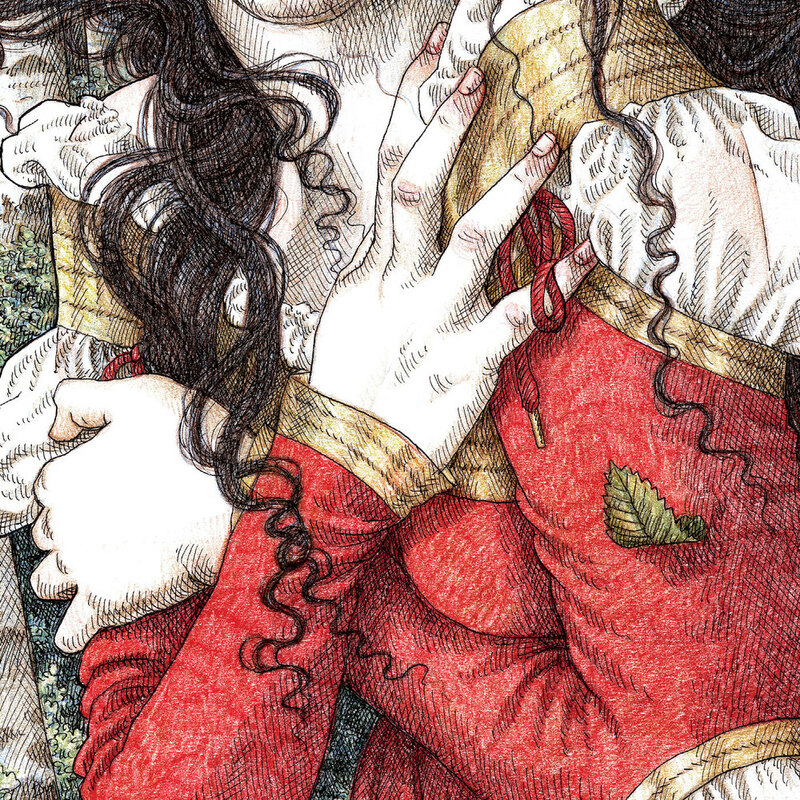 I opted for a fairly limited colour-palette with the focus on her red gown, and set it in a vaguely medieval period that seemed to suit the story with it’s roots in old Germany. 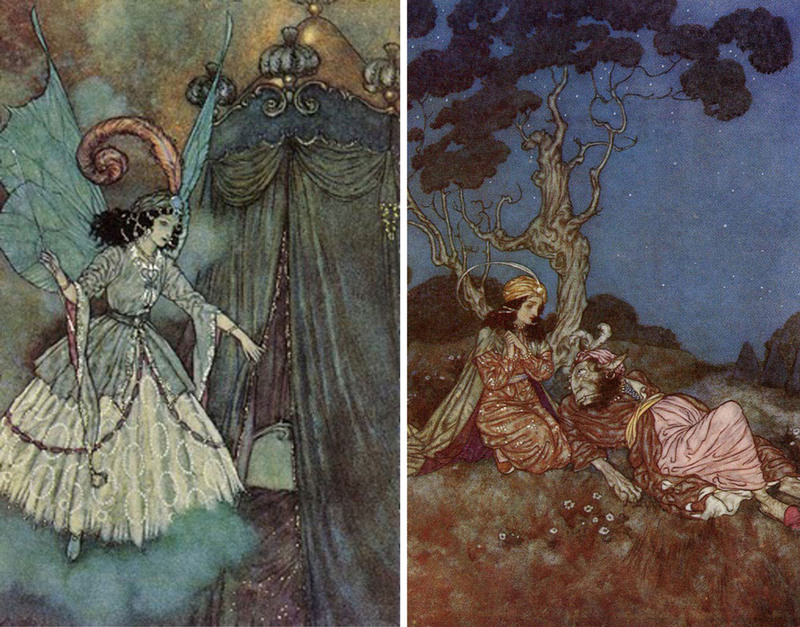 There are unwritten laws regarding time-periods and national costume attached to all fairy stories that usually hinge on where and when they were written—for example Cinderella (Charles Perrault) is almost always set in the century and country in which it was made popular, early 18th Century France. Although I was consciously ‘freeing-up’ my style I took a lot of photographs of a friend’s daughter Shannon in the role in order to maintain a lifelike likeness throughout the book—I don’t bother hiring or making costumes but dress my models in anything that bears the same shape I am looking for then add all the details in the actual illustrations. I only need a shape to work with and the way the cloth drapes the figure as it moves. 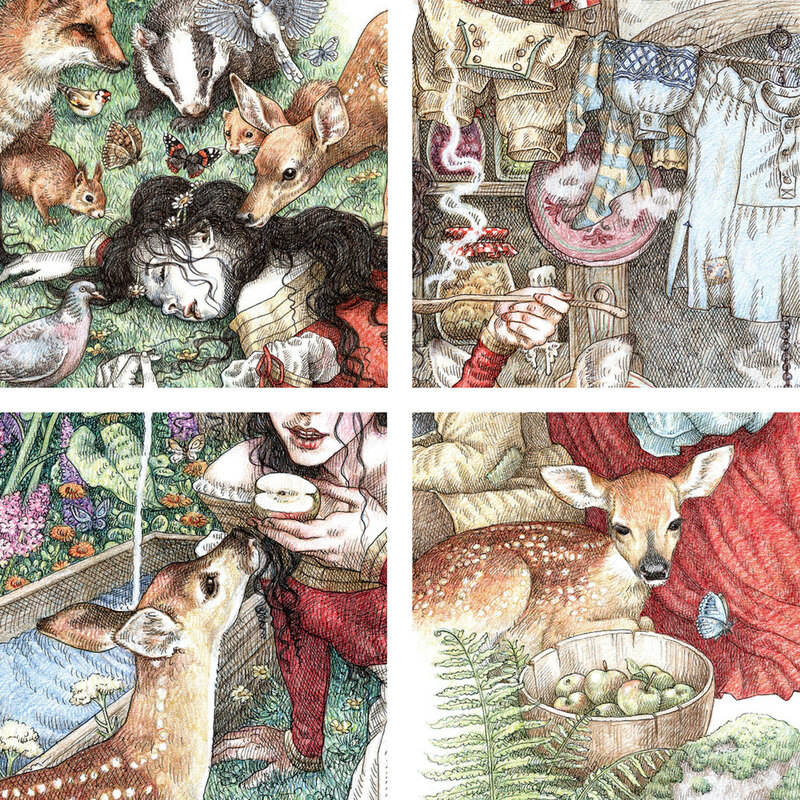 I consciously tried to make Snow White a strong, lively character, not a victim or a weakling, so that she would appeal to today’s young female readers; each generation of fairy tale books is reinvented for its new generation of readers with different self-images and aspirations which is why these books remain so vital and alive after all this time. I want my princesses and knights etc to actually inhabit their clothes and their environments so that they are believable beings that can bring the story to life. While trying to keep the illustrations light and airy I still wanted to add all the details that add depth and interest. 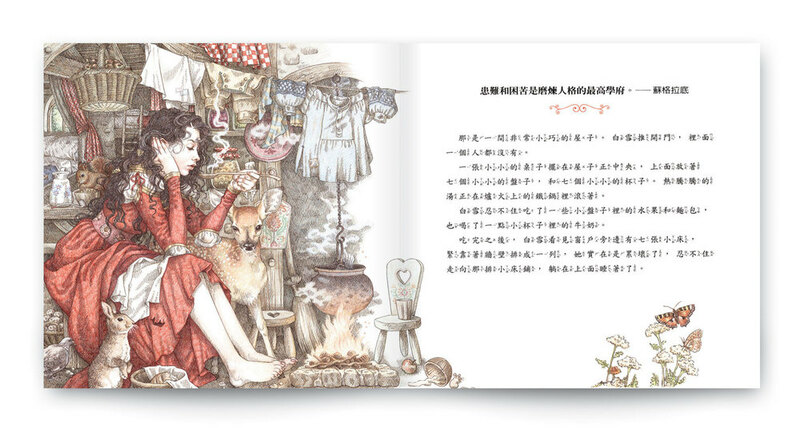 I can still remember how picture books captivated me as a very small child—3 or 4 years of age—and how I would sit for long periods totally lost in the details. That’s another reason why I believe in the diversity of children’s literature and illustration and strongly disagree with the many publishers who insist that what children want is brightly coloured simplicity. 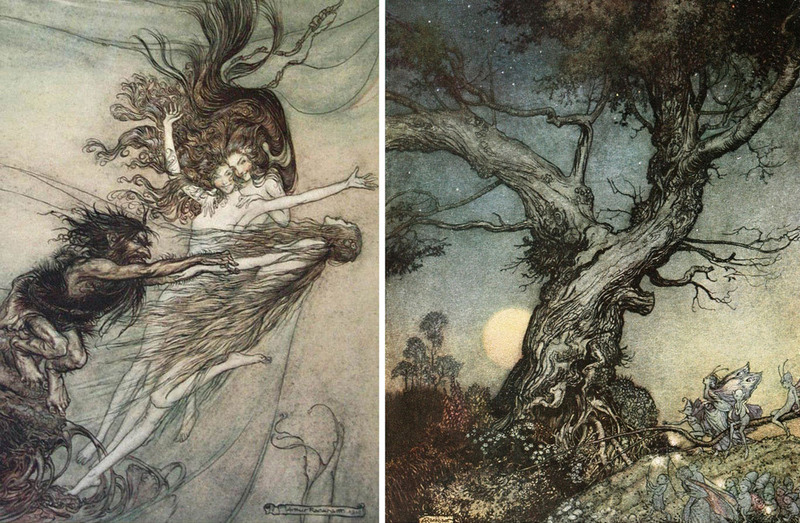 My mother would buy me old books at jumble sales illustrated by masters such as Arthur Rackham, Edmund Dulac and W. Heath-Robinson so that I appreciated even at a very young age that not all colours must be vivid, that a monochromatic or a limited palette created a certain atmosphere of subtlety and intrigue. I know for certain that this is not lost on today’s children. 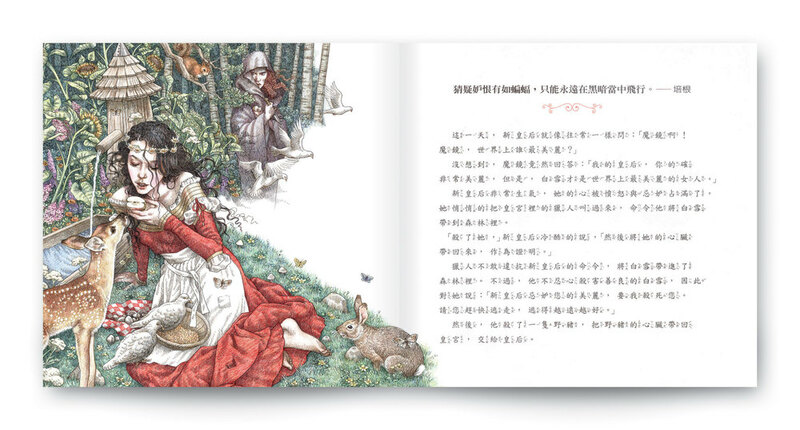 Many of the blacker, more disturbing parts of the story have been omitted from this edition by Grimm Press though I would have dearly loved to have illustrated the real version recorded by Wilhelm and Jacob Grimm (Schneewittchen as it is called). 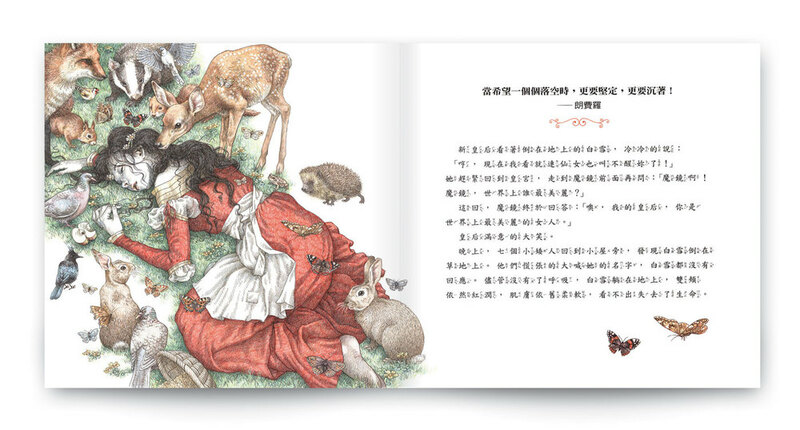 It was her real mother who wanted Snow White dead and who goes as far as to eat the wild boar’s heart and liver believing them to be her daughter’s. How I would LOVE to illustrate the original stories in all their dark goriness, I hate the fact that they have been sanitized into mere shadows of their former selves; I don’t believe they are harmful to children who are quite aware of the difference between stories and reality and do believe that grisly tales and the emotions they arouse in contrast to our actual lives are vital to our psyches. Encountering villains and their dark deeds in the safety of books and films before we are old enough to experience the world for ourselves serves as a warning that life outside the cosy confines of childhood is a dangerous place and to deprive children of the whole picture is to set them up for a great fall. 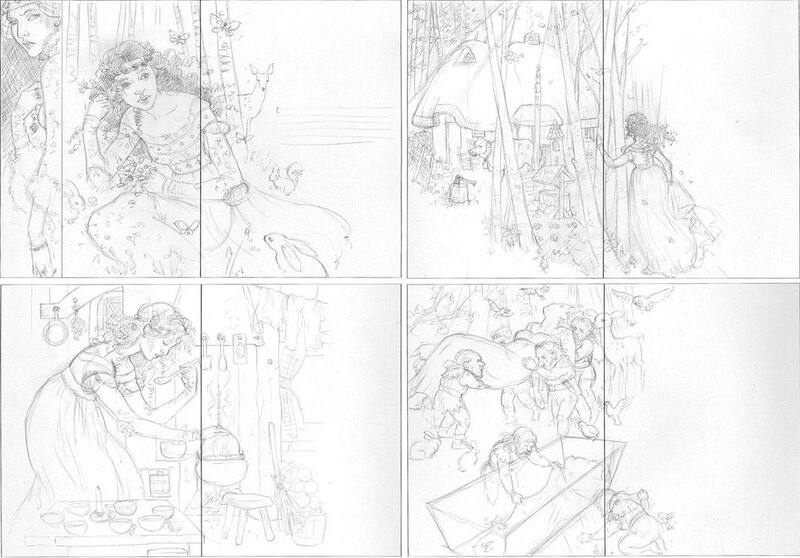 Anyway—here are some of my (sanitised) Snow White spreads. What I didn’t know at the time was that Grimm Press has a team of very talented animators and wholly believes in the relevancy of Interactive Apps in raising the levels of children’s literacy. 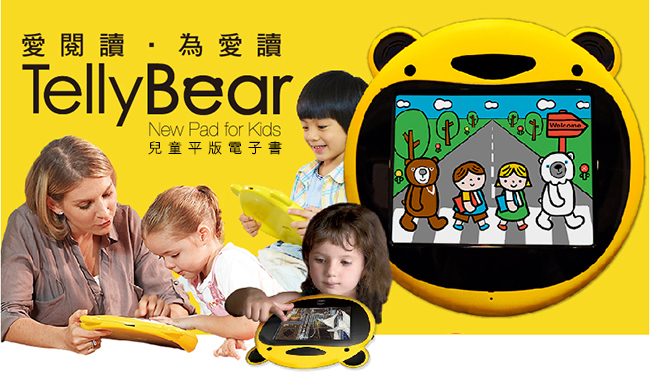 They have been quick to surge ahead with the latest new technologies, even designing a child-friendly player for their digital Apps called ‘Telly-Bear’. It remains my ambition to create some Apps of my own (if only I could afford an animator!) and have discussed with colleagues at great length the importance of maintaining the look and function of a moving, talking BOOK, and not becoming just an animated short. 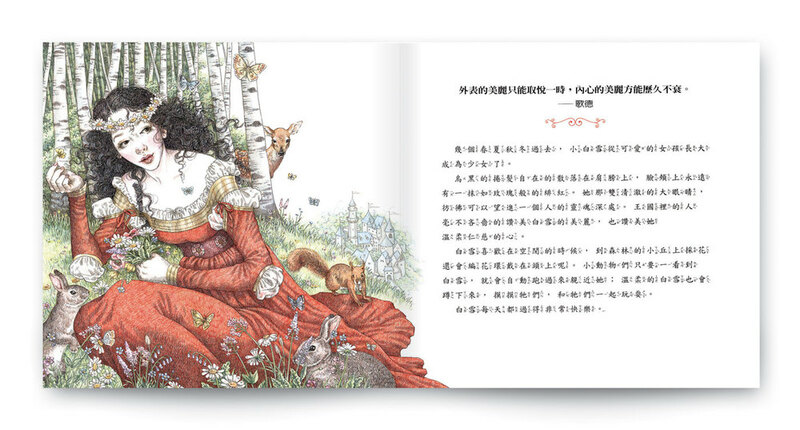 I am delighted that Grimm’s App of Snow White mirrors my own sentiments, retaining the look and feel of the words and the illustrations, adding more layers of sound and movement yet retaining the integrity of the picture book.